Calling all professionals with NIBM diploma or professional qualifications, NSBM, the Nation’s Premier Degree School offers a unique opportunity for working professionals with NIBM Diploma or Professional Qualifications to be a graduate from a world’s Top Ranked University – The University College of Dublin (UCD), Ireland. 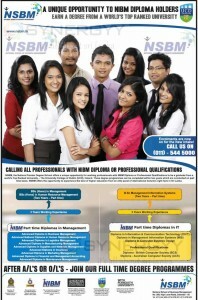 These degree programmes can be completed within two years which are conducted on part time basis. NSBM offers the opportunity to experience the best of higher education from an elite panel of international lecturers’ right here in Sri Lanka. With these Part time Diplomas in Management and 3 Years Working Experience you could fo an 2 years Part time degree Programme of BSc (Hons) in Management or BSc (Hons) in Human Resource Management. With these Part time Diploma in IT and 3 Years Working Experience; you could follow 2 years Part time B.Sc Management Information Systems degree programme at NSBM.